If you have recently noticed weird search and replace behavior in SDL Trados Studio 2014 SP2, a workaround (that only works in certain searches, however) could be as simple as closing the “Find options” pane. In the “Find what” box I entered two spaces, and one in the “Replace with” (to search and fix accidental occurrences of double spaces). When I launched the search, the program started by finding every single character in my translation, i.e., it was stopping at every character, whether it was a space (let alone a double space) or not. When I closed the “Find options” pane the search behaved as expected. With the “Find options” pane expanded, select “Match case”. In the “Find what” box enter an upper case letter (no matter which, so long as it is present in your translation. The program will behave correctly, finding only instances of the upper case letter you searched for. Without changing anything else (i.e., don’t deselect the “Match case” box), close the “Find options” pane. The program will now find every single instance of the letter, both upper and lower case. This is a new bug: I’m sure that before SP2 Studio did not behave this way. The first issue (the one that has to do with searching for double spaces) might be specific either to Studio professional or to the way it is installed on my machine: I've tried the same search on another computer where Studio Freelance was installed, but the program behaved normally (i.e., it did not match every single character). On the other hand, the second issue (not taking into consideration the options when the Find Options pane is closed) can be reproduced on other machine, so I would consider it as a real bug. Exactly ten years ago I published When the "correct" translation is wrong, my first post in this blog. 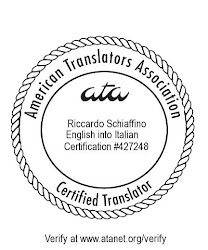 Approximately a year after we established Aliquantum, our translation company, I launched About Translation, without a specific plan but with the idea that it would help attract customers.Since it wasn’t planned with customers in mind, however, it hasn't attracted them: it is read mostly by other translators who are interested in the same things that interest me. In hindsight, it is probably better this way: I might have abandoned the blog if it wasn't about something I personally find interesting. The name of this blog is a homage to the title of Peter Newmark's book "About Translation". This was among the first blogs on translation (though certainly not the first), and it is now among the oldest still running (but there are a few still active that were started before About Translation); the oldest I know is Transblawg (going strong since 2003). About Translation recently passed the one million pageviews mark on Blogspot (but Blogspot stats only date back to 2010). The real number is probably 1.25 million: using a different stat system, I had counted a total of 250K pageviews five years ago. Translation technology (e.g., CAT tools), business practices, and advice to beginning translators. The number of posts has gone up and down during the years, with a high of 74 posts in 2006, and a low of 14 the following year. The total is 454 posts so far (including this one).